Britain, a nation of climate sceptics? Really? 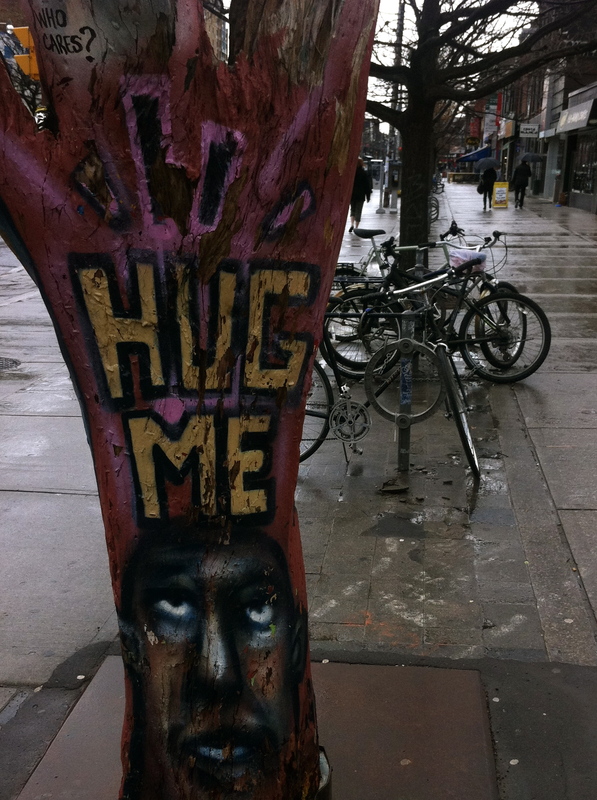 Street art – or rather tree art – in Toronto. The latest British Social Attitudes survey was released earlier this week. Cue much swapping of claims to know what the public really thinks, and how well this does or does not match government policy. The Prime Minister issued a short statement suggesting the results showed a “crucial shift in our society” and that people were “making it clear that they’d had enough of the [previous government’s] something for nothing culture”. Personally, I don’t think survey data like this makes anything clear. The public don’t speak in one voice, but many, complex and changing ones. You can’t read a singular view of the people off blocks of data like this, no matter how strong the methodology, how pretty the infographics or how tempting the political message. Still, such data is interesting, I’d even say important. It takes us out of anecdotes of people we met in the pub last week and our own small social circles and makes us think, as best as we can, about the country at large. The chapter I was most interested in was the one on the environment. It’s entitled “a paler shade of green” and the central message isn’t exactly rosy for those who campaign on environmental issues. The Guardian ran with “Public support for tackling climate change declines dramatically” or, from the Daily Mail, “Rise of the climate change sceptics“. I agree the results include many items of concern for the environmental movement, and for science communication too. However, I’m really not convinced by the narrative of a rise in scepticism, especially the BSA’s own focus on the impact of Climategate. Such surveys can have a rhetorical power in themselves (e.g. Cameron’s claim the people had spoken with him) so I think it’s important to check such narratives. I guess the headline result is that 37% think many claims about environmental threats are exaggerated, which is up from 24% in 2000. I want to ask, however, whose claims? That is, have people stopped trusting the science, or do they just feel there is a lot of exaggeration and hype around environmental politics? Maybe it’s less a matter of the impact of Climategate, and more a bit of climate media fatigue. You might trust a scientist on the news, and yet still find a DECC advert annoying. For example, Attenborough’s calm concern in the latest Frozen Planet is rather different from exploding schoolchildren (or, for that matter, posing with huskies, or ads “made from recycled clips” or a host of other stunts). Personally, I don’t think we can take this data simply as a sign that sceptics are winning the climate communications war. It could be that too. We just don’t know. (* I think the latter is a really interesting choice of statement – to me, there is something slightly 20th century about it. As technofixes become more part of public discourse, I wonder if it’ll be the right way of measuring things? I also thought it was interesting that they asked about impact of pollution on the British landscape – polluted rivers, etc. Climate change is maybe a slightly different story, a more esoteric question of satellite images, detailed debate between scientists and complex graphs, glaciers melting in largely unpopulated poles and stories of flooding in parts of the world we are not used to hearing news from. There is a strong link between environmental concerns and national identity in the UK and elsewhere, but climate change is a more global issue. But I digress…). All that said, I did think data around whether people agreed with the statement “Every time we use coal or gas or oil we contribute to climate change” was something climate communications people should worry about. In 2000, 35% said this statement was definitely true, 46% said it was probably true and 12% said definitely/ probably not true. For 2010 the results change to 20%, 51% and 17% respectively. There were also marked drops in concerns over the impact of cars and agriculture. As the report says, this might be due to people thinking they’ve been partly solved by “cleaner” technologies; it’s harder to explain away the impact of coal/ gas/ oil on climate statement quite so easily though. If you want something cheering, maybe age will help though: the sharpest drop in people agreeing that climate change was dangerous came from people 55+. This was down 13% from 56% to 43% with over 55-64 bracket and down 19% from 47% to 28% with over 65’s, but only down 3% and 1 % respectively to 48% with 18-34s and 15-54s (p103). I’m not sure 48% agreement is a particularly good score though anyway. The report also notes a decrease in political activism (p95-6). Maybe this shows a failure of green groups to reach out of usual audiences? Or maybe the activism issue is a timing thing, as the data considers a period not too far from the election (and I think it was collected pre-forests). There is the economic downturn issue again: haven’t all donation-based groups suffered from drop in support? I also wonder if people who’d signed up for anti-airport protest because they don’t like noise would have necessarily have thought of it as an environmental issue? I don’t know. I do think it’s interesting though, and would be interested to know if the green movement is worried. It was interesting to look at how the data on concern over global warming mapped onto party political sympathies. ls green politics too tribal? Conservative supporters (38%) are less likely to show strong concern than those who lean towards Labour (49% – a decline compared to 2000 interestingly, unlike other parties) or the Lib Dems (55%) (p102). One final thing that bugged me about this report was that it didn’t really examine how and where people got their information about the environment from, and yet still felt able to make loose connections between the timing of Climategate and the apparent rise in scepticism. From the final pages: “we conclude that media coverage may make a difference – not least ‘new’ media and the internet ‘blogosphere’ where unfounded opinion can sometimes be favoured over scientific fact” (p106). The impact of the media on people’s understanding, reasoning and framing of any issue, perhaps in particular ones including esoteric expertise like climate science, is incredibly complex, and the BSA report writers should have known better. They should certainly know better than to make loose comments about unfounded opinion on blogosphere (which is a large, diverse and porous area of activity). I also don’t see how they can look at a change over ten years and say it has to be something that happened in 2009, no matter how much media ink was spilled. To their credit they do also say it could also be matter of fatigue and refer to financial cost, etc. Personally, I’d like to see them acknowledge that they don’t know and call for investment in more research here. Anyway, there is a lot more in the BSA report. Do please go and read it for yourself. My scepticism over some of its analysis aside, it is worth reading. I’m glad the government invests in social research like this (I wish they invested more). If you are interested in public attitudes and knowledge of science I can also recommend this excellent paper (paywalled journal, but you could try emailing one of the authors for a copy). It’s worth having a look at the Eurobarometer on attitudes to climate change (pdf, 2008) and some of Leo Barasi’s blogging on polling around Climategate, as well as recent studies from the USA. In terms of media effects science issues, this report from Cardiff (pdf, 2003) is old but still relevant (and free to access) and comes highly recommended. EDIT (12/12/11): see also Leo Barasi’s take on this (where he stresses timing of survey, a point I’ve heard made about other chapters too), and a shorter version of my post on Liberal Conspiracy. EDIT 15/12/11: … and Adam Corner’s piece for New Scientist. 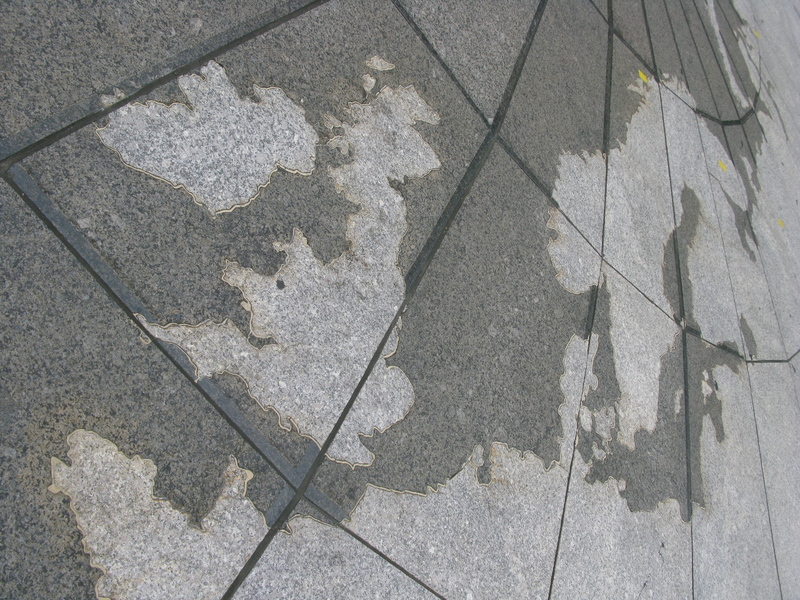 Public art in Washington DC – a fountain floods the sidewalk to reveal a map of the world (little raised edges protect coastlines). This entry was posted in environmentalscience, publics and tagged environmental science, publics on December 9, 2011 by alice. Thanks for this post! Really really thought provoking. We are just trying to finalise a little study and are getting bogged down in the complexities. ‘The media’ are certainly not a proxy for ‘public concerns’ or ‘public opinion’ ir ‘public interest’ in/about climate change; ‘the blogosphere’ is neither. The relation between what the media do and what people are concerned about is not straightforward at all. The relation between climategate and climate fatigue is complex too. There is a cross-over, but, again, not a straightforward one, and the same goes for climategate and climate scepticism….. More research is certainly needed (and being done e.g. Lorraine Whitmarsh, recent article in Global Environmental Change etc etc., Adam Corner, Stuart Capstick etc)!! This is a great article taking a critical look at the British Social Attitudes survey and the commentary growing around it. Great that this got posted on LibCon. It is undoubtedly true that there has been a lot of exaggeration about climate change – with the news media linking almost every extreme weather event to global warming even when the science doesn’t support it. I agree that the BSA questions were not detailed enough to correctly determine attitudes towards climate change. I suspect, as with most other things, that there is now greater polarisation than a wholesale shift.